Hey, everyone. I'm hosting indie author Kelan O'Connell today. Take it away, Kelan! I'm white. Thought I'd just put that right out there. I'm not African American, Latino, Chinese American, or even a Chinese immigrant. But I've written for characters who are. In doing author interviews about myself and my novel, Delta Legend, I'm often asked about its diversity and the choice to have many of the primary characters (especially my protagonist) be racially and culturally different from me. Truthfully, it wasn't so much an intentional choice as a natural occurrence that developed along with the story. I can assure you I didn’t wake up one day and decide I wanted my main character to be a 16-year-old African American guy. The first character of Delta Legend was the Delta itself. Calvin Pierce came next and was born out the need for dramatic conflict. Let's see ... who would feel like a fish-out-of-water in the heart of a predominately-white region known for agriculture and recreational boating? A black, inner-city teenager, that’s who. Mei Li Cheng was also a natural choice when considering the history of the Chinese and Chinese Americans in the California Delta. I grew up in what was, and sort of still is, a predominately-white East Bay suburb of San Francisco. My dad worked for Coca Cola, calling on restaurants, bars, and other venues in and around the city. Sometimes, if I was lucky, I got to skip school and go to work with him. Once I got a taste of San Francisco's diverse population with its distinct cultural communities, I was hooked. I loved hearing different languages being spoken, not to mention sampling a cornucopia of different foods. People adore my dad, so of course his clients were always feeding him (and me) whenever I got to tag along. Imagine an elementary school kid from the WonderBread burbs getting to experience a hidden gem restaurant down a back alley of Chinatown, a traditional taqueria in the Mission District, gnocci in North Beach and mochi ice cream in Japan Town. Our day would usually end at Mission Rock, a place that got a bit fancier once the new Giants Stadium was built, but back then it was simply a locals bar with pub grub and was fondly known as "The Rock." My dad would sit me on a barstool while he had a beer with his pals and we watched large Samoan men shoot pool. A day in the city with my dad was a cultural and epicurean field trip that was far more educational than any day at school. It's easy to see why when it came time to pick a college, I chose San Francisco State and continued to live in the city for 12 years until I got engaged and was finally pried away. Regardless of my urban exposure to different cultures and races, prior to writing Delta Legend, I was like a lot of other writers who simply go on the premise that unless we state otherwise, our characters are white. All that changed for me when writing first the screenplay, and later the novel version of Delta Legend. Suddenly I had to clarify if someone was white-it was not a given. As the goal of a screenplay is to show not tell, you can get away with a bit less character development when writing for screen. You rarely get inside a character's head to say what they're thinking or feeling. 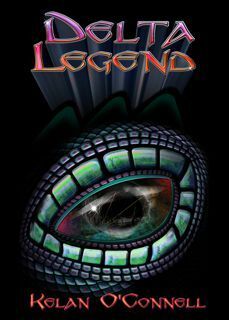 Creating the screenplay version of Calvin Pierce wasn't all that tough for me, but when it came to writing the novel version of Delta Legend, I initially danced around Calvin, unsure if I could properly represent him. Fortunately, as with all my characters, Calvin ultimately took the reins of his own story, told me to sit at the computer and take dictation. One of my all-time favorite films is Spike Lee's Do The Right Thing. I love the part where individual characters talk directly to the camera, going off on these tirades of racial slurs. It's so over-the-top, it makes them look completely ridiculous-and laughable, which of course, is the point. While Delta Legend touches on issues of racial and cultural differences, it mostly does so with humor, and it's not the primary focus of the story. Even though it's fantasy, I hope the characters realistically represent how we all think and act and relate to people of different races, cultures, even sexual orientation. And no one gets out unscathed. It's true you need to do a bit more research when writing for characters who are of a different race or culture than your own. But like everything else, you find the resources and people to help you. Luckily, I have a niece and nephew who are mixed race, African American and white, so I had some expert assistance in terms of hip hop culture and slang (which is continually evolving and changing). And let me tell you, Cody and Kelsey saved me from myself on more than one occasion. I would like to see more multiculturalism in YA, and not just extraneous sidekick characters, but the protagonists. As the United States and other countries become increasingly more diverse, we need our literature, especially our YA fiction, to reflect that. I get the feeling agents and publishers still believe those who buy the bulk of YA Books (white females) need to be able to envision themselves as the main character in order to fully immerse themselves in the story. But that's simply not true. Of course YA fans can identify with the core feelings and emotions of characters who are racially or culturally different from them-readers of color have been doing it for years! And no writer worth their salt only goes skin deep with any of their characters anyway. As a writer and the mother of a biracial son, this was a fascinating read for me. I'd like to say more, but I need to mull over this lest I put down words just to have a longer comment!